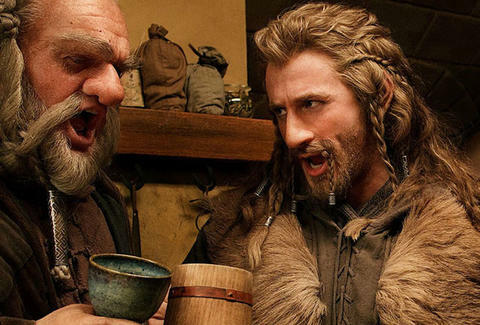 Photo courtesy of New Line Cinema Peter Jackson's first installment of the Hobbit trilogy's now on DVD and On Demand, and since that means you and your Fellowship are going to be sitting through 3hrs of sword fights, long gazes, panoramic vistas, singing dwarfs whose names all sound the same, dainty little men with big feet, poop-smeared wizards, and fighting rocks that aren't Chris, we've designed a drinking game to make the action way more epic. You'll pound beers every time songs are sung, swords glow, and Gandalf doesn't realize he's asking an awful lot of Bilbo... Which is to say, you're gonna have a hard time telling your Thorins from your Dorins after about half an hour, so download the game and get ready for the ultimate quest.